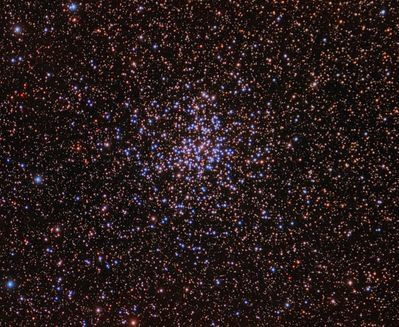 Messier 37 is an open cluster found in the constellation Auriga. The brightest star is a red giant (the cluster contains about 35), which is visible in the image near the center of the cluster (magnitude 9.1 – 9.2). The distance to this cluster is about 4500 light-years, although it may be a bit further. Image taken with a TeleVue 140 f/5 refractor and a SBIG ST2000xcm camera at – 20 degrees on an Astro-Physics 1200 mount (6.5 hr total exposure; 39 x 600 sec lights, 20 darks, 64 flats, 64 bias; Image acquisition with MaxIm DL and processed with PixInsight 1.8.1.1092 Ripley (x64).